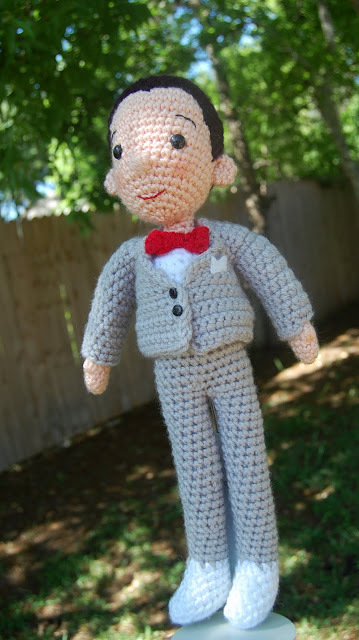 Just a quick post to let you all know I'm selling a Pee-wee Herman doll on ebay to benefit the victims of the recent central Texas wildfires. I live in Austin, just about 30 minutes away from where there has been a LOT of devastation, and I wanted to find a way to help out. All proceeds after listing fees will be donated to the Central Texas Wildfire Fund, so please check out that charity if you aren't able to bid. Thanks for visiting and if you know anyone who would like a Pee-wee, please direct him or her to my auction. Click on Pee-wee to check it out! *The auction ENDS on Wednesday, September 21st in the afternoon, so please place your bids soon! Help me help Central Texas! I hope you raise a lot of funds! I dont find a good link for the 3 pattern set for Pee Wee Herman. How much is it? Thank you.